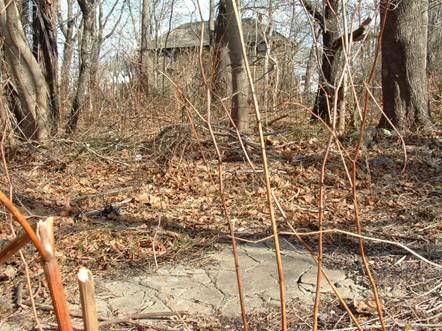 Near the end of Elm Street in South Amboy NJ lie the remains of what was once the RRRR Bergen Hill Station. The best photo I have ever seen of the Station is shown below. 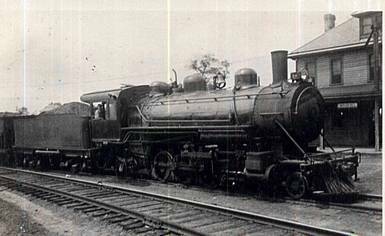 This photo is used at the bottom of Page 74 of Fred Deibert’s “Rails Up The Raritan”. I know this station was used for passenger service but I’m not sure if it had any freight use. If it didn’t, and since passenger service on the RRRR ended in 1938, I doubt this building saw much action after that date. 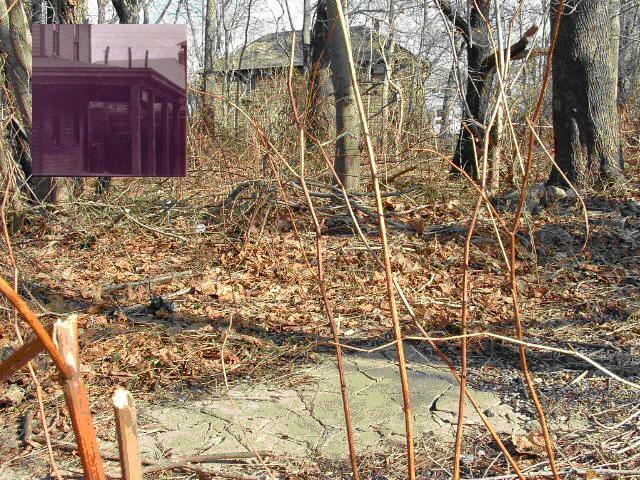 All that now remains of the Station is its foundation, hidden by overgrowth, leaves, & branches perhaps 25 feet from the old right-of-way. Not far away is a building on Elm Street which is easily confused with the Bergen Hill Station. Having large doors that look like they would easily handle deliveries, the building looks not unlike something that a railroad would own. However, this building was once the Burlinski (sp?) Coal Company. I asked some life long South Amboy residents familiar with this part of town if Burlinski’s ever took deliveries from the RRRR. None I asked could recall that ever being the case. In an effort to document what was left of the Bergen Hill Station I made my way to the intersection of Center & Elm Streets armed with a new digital camera (my first!). 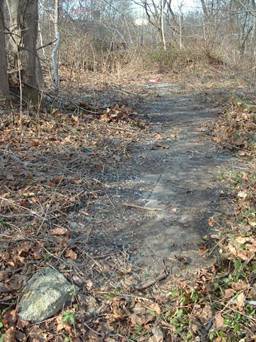 Directly across from Center Street is a dirt road/path that makes its way into the woods. At the end of this road and perpendicular to it is another dirt path which was the RRRR’s right-of-way. Turning right will take you toward “The Red Bridge” which was the RRRR’s crossover of the Pennsylvania Railroad right-of-way (now the Amboy Secondary). 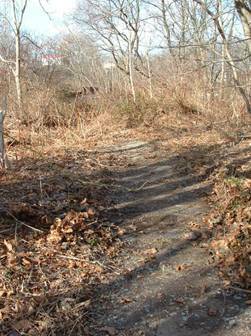 Before reaching the Red Bridge, though, if you were to turn right into the overgrowth you would come across the remains of the Bergen Hill Station. I found the foundation’s remains after kicking around a few leaves. However, to get some decent pictures I cleared a better swath of ground. The below photo is a close up of the concrete that remains. The two photos below are taken from the same vantage point. 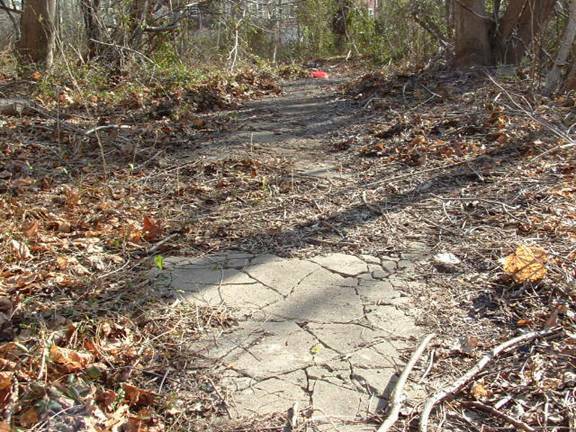 Both photos show what appears to be a path through the woods. However, this “path” is the area I cleared to expose the Station’s foundation. The photo on the top has the Red Bridge shown better in the background (blackish item to the left, about a third of the way from the top of the photo). 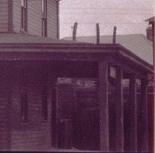 The photo on the bottom has a small pink item visible toward top center. 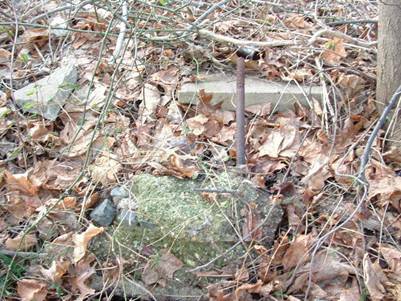 I found this thing in the area and used it as a visual cue to mark the end of the foundation (the beginning of the foundation can best be seen in the foreground of the bottom photo). I paced this distance and would estimate it to be about 45 feet. The below photo attempts to do the same, but this time facing away from the Red Bridge. To be quite honest there isn’t much to see here. I found some old chunks of concrete (one with a metal support rod) and a slab of well-defined concrete (see below photo), but I wonder if all of these are parts of the Station. However, in the absence of large piles of dumped construction material, I’ll place my hopes in that these pieces are actual Bergen Hill Station remains. To put things in perspective with the surrounding area I took the below snapshot of the Station foundation with the Burlinski Coal Company building in the background. It’s sad that this is all that’s left of the Bergen Hill Station, but I guess it’s better than nothing. Don did an amazing job of discovering the Bergen Hill Station location! We recently found, courtesy of Bob Kipp, some original pictures of the Bergen Hill Station! 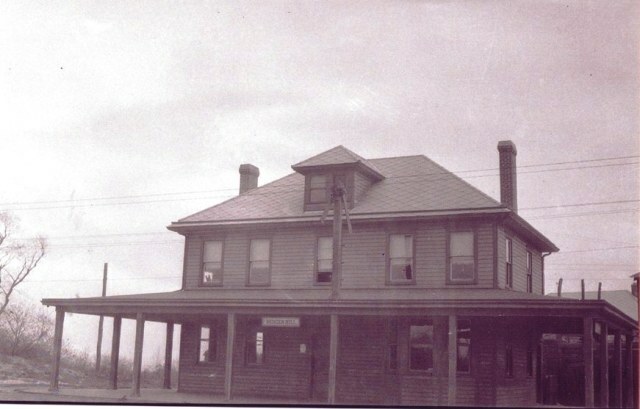 Note the big long concrete porch around the base of the station in the above picture. Don discovered this long run of concrete above in Pic 5! Note small building behind the Bergen Hill Station. To me, the roof lines are too similar to not be the same building. 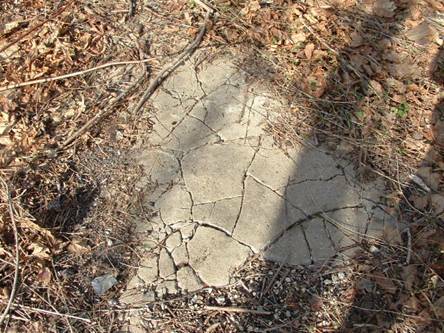 Proof that this is the concrete porch and foundations of the long lost Raritan River Bergen Hill Station! Way to go Don! Thanks! More Pictures of the Bergen Hill Station, courtesy of the Bob Kipp Collection! 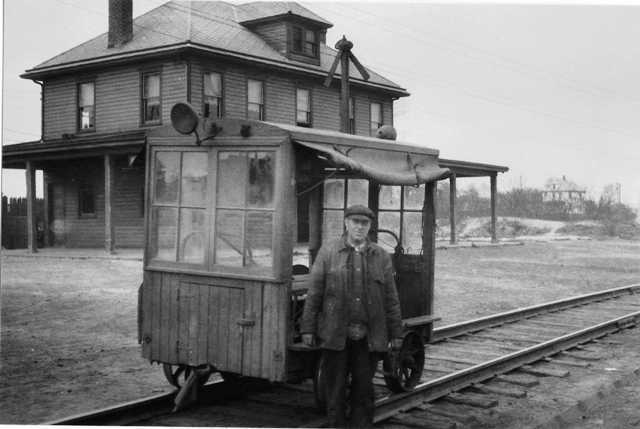 A Raritan River Railroad Speeder! In front of the Bergen Hill Station! Here is an entire forum dedicated to discussions of the RRRR!